Imaginative, versatile, and a master of concept, Brooke Shaden is a fine art photographer specializing in staged photography that combines allegorical symbolism with personal narrative. Utilizing props as well as commonplace objects, Shaden transforms the world around her into compelling, intricate dreamscapes that combine the strange with the familiar. 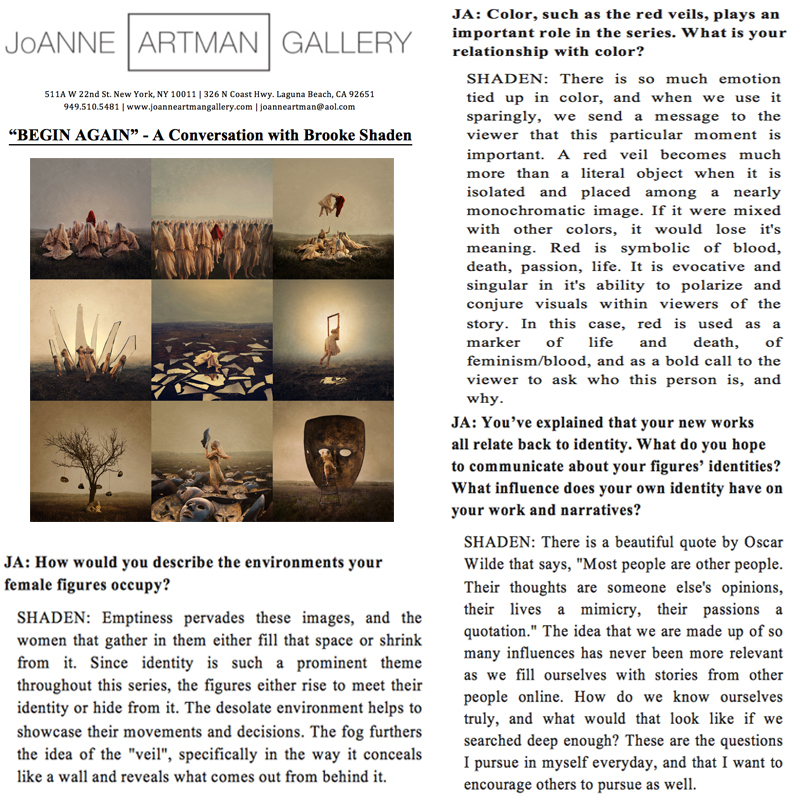 JoAnne Artman Gallery is pleased to present Brooke Shaden’s new body of work that explores notions of permanence, survival, as well as the classic theme of man versus nature. One of the main themes is the eternal struggle of survival, of human nature versus mother nature, of the fragility of human life and the endurance of human spirit. Allusions to this classic theme abound throughout the work, evoking ancient stories, myths, and records on the subject of the human condition. In a famous quote from As You Like It by Shakespeare the state of the human condition is presented: “All the world’s a stage; And all the men and women merely players.” In the same spirit, Shaden’s dreamscapes can be seen as the fashioning of a new reality, a means of taking control of life’s uncertainties and anxieties. Brooke Shaden’s work will inspire, provoke, engage and mesmerize. With visual perceptions always changing, peek behind the stories told and you're sure to find the right artistic expression.